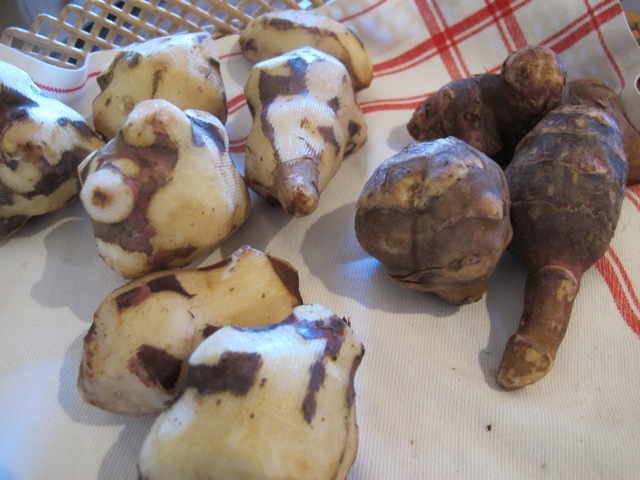 These knobbly numbers are Jerusalem Artichokes. The name has nothing to do with Jerusalem the town and even less to do with the noble globe artichoke. It derives from a corruption of the Italian for sunflower–girosole–-which, because of the way it sounds, morphed into Jerusalem. Also known as sun chokes, sunroots, topinambor and earth apples they are a species of sunflower and originating from the eastern side of North America–their health benefits, especially for diabetics, are explained here. Duplicitous, yes, but also delicious and especially here when mixed with capers, white wine and pieces of chicken. 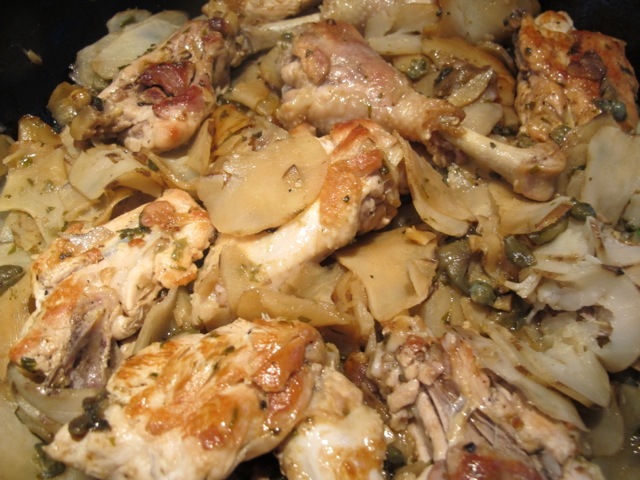 Marcella Hazan devised this recipe. One caveat–they do have a reputation for causing flatulence–but hey! Park them in a bowl. 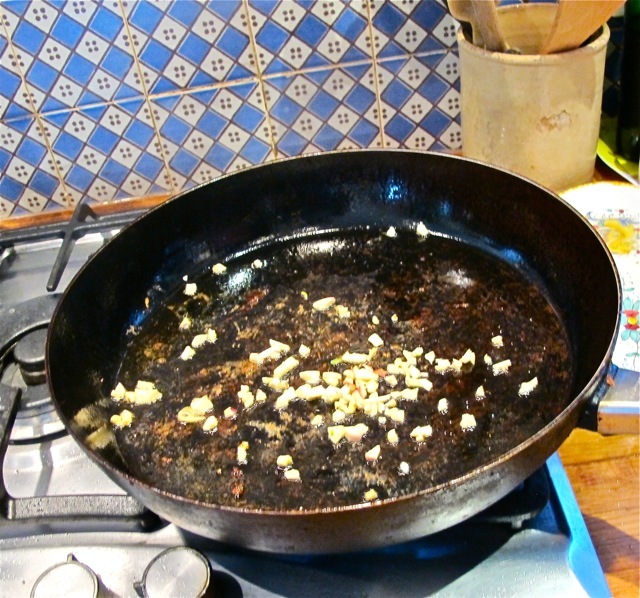 Add the garlic and sauté briefly. 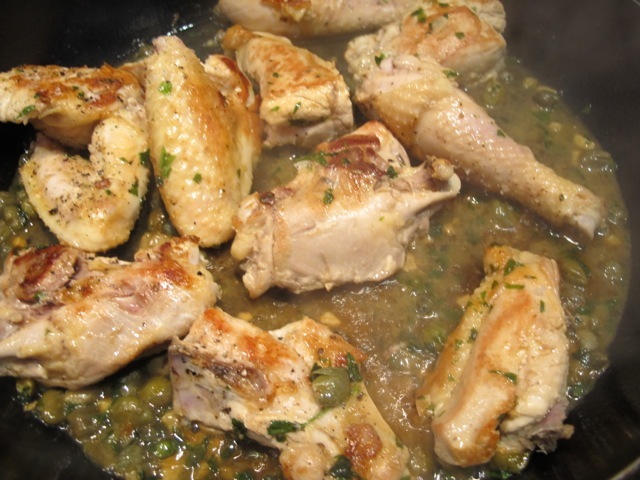 Mix in the parsley, capers and wine before returning the chicken to the pan. Turn everything again and add the artichoke slices. Again turn everything over a couple of times and cover the pan. 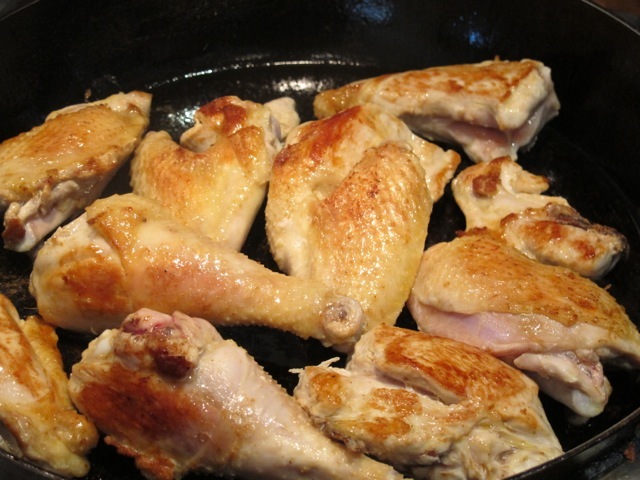 Cook on a very low heat for 30 to 40 minutes. It’s good to let the condensation moisten and tenderize the artichokes–so resist the temptation to lift the lid too often. A couple of times is good to check the liquid–add a little water if it is drying out–and turn it all again. We are seeing a movie tonight with some friends so I made this last night and stored it in the fridge. 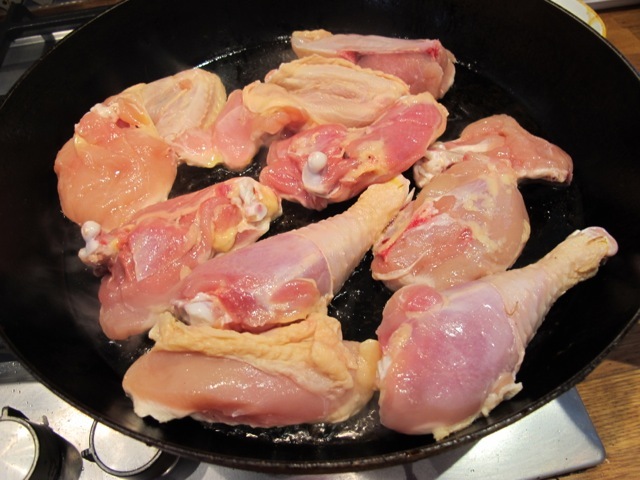 I shall reheat it slowly when we get home and before you can say Jack Robinson or Jiminy Cricket, we’ll be sitting down tearing the chicken (and the movie) to pieces! Interesting recipe and I love capers. Wondered just exactly what is served with, ie carbohydrate wise. Rice? Or do you serve with crusty bread and side salad? Rice (basmati brown)is what we had tonight, Judi. basmati brown is what we had tonight, Judi. Robin: Love your blogs…you make me laugh. This dish looks delish. Is that an organic free range chicken? (We have a problem with GMOs in the USA). None-the-less, what fun reading your blogs. Hope the movie is good, I know the meal will be! When did you add the wine? With the parsley? I think you were a bit restrained in describing topinambours as ‘having a reputation for causing flatulence’ – I was told that they should be called fartichokes. 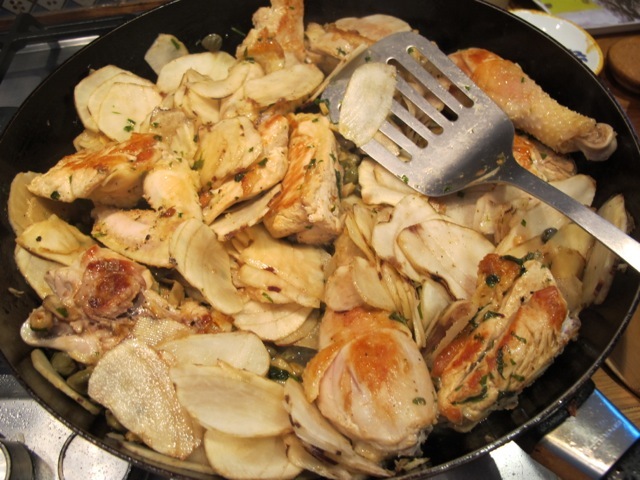 Love your recipes which I regularly use here in rural Lot-et-Garonne. Well you may say that, Sara–I could not possibly comment!